Nitro Designs, the first and only commercial airbrush studio affiliated with Australia’s Advanced Airbrush has launched a unique approach in meeting the desires of car enthusiast of the new era. With the launch of “The Matte Deal”, Nitro Designs has opened up a new acceptance of ferocious matte effect colors like no other. Automotive painting works have earned its standards of pricing by the materials used and the finishing skills of the painter. 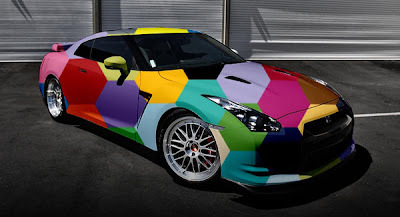 The value of any automotive paint work is determined by the hours spent in dismantling parts and panels, preparation time of the surface to be painted, materials used, painting hours, polishing & wax and reinstalling of parts and panels. Do you know that if you can do all the above yourself with your own time & materials, an actual workmanship cost alone by any good painter to paint your car in an oven-baked spray booth will not be above RM300.00? Matte colors has begun staging its presence here locally ever since the drifters in our local scenes got them on their rides to save cost in maintaining the looks of their rides which goes through constant damages and scratches. Black was the only color thought to be of matte finishing. We’ve got news for you; all colors can be customized to matte finishing. You may wonder what the difference is between the shiny gloss coatings compared to a matte finishing car. Well, there is one main difference – Gloss, or the industrial code known as clear coats, are protective layers preventing the color of your car from fading and minor scratches from reaching your paint layers. As for the matte finishing paints, it does not have any protection coats above the paint layers. So why go for matte? Time. Matte effect colors can save you and your car workmanship time by half compared to a gloss finished color effect. If you were to get a visible scratch on your glossy front bumper and need to get touch-up work done, it takes at least 8 hours of proper drying time to get a good finishing. You say that your painter can get it done in 4 hours? That is because he is using fast-dry clear coats to make a quick buck which is cheaper compared to slow-dry clear coats and ends up as a faded paint job for your complete bumper after 5 months. Good lasting gloss is a product of slow-dry clear coats which require 30 minutes of oven baking and 7 ½ hours in surrounding cooling temperature and after that polishing. With matte, the paint dries off in 2 hours, no polishing needed. Gloss paint works does not promise you a scratch-free ride but matte can promise that you will stand out from the rest and best of all, save you time and money. And this is why Nitro Designs has come up with a solution to offer its customers a complete free body re-spray redeemable within 2 years. To sweeten the deal, they will make it 3 years if you’re a fan on their Facebook fan page. Matte colors – it’s a new trend which promises to make heads turn. Do you want to be part of the deal? 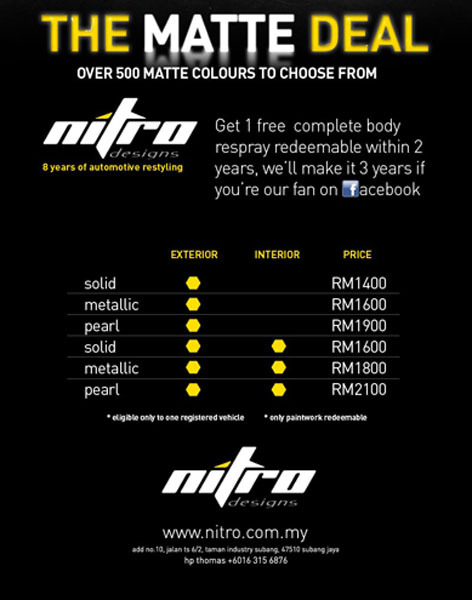 The Matte Deal, brought to you by Nitro Designs. Personally, I would like to try on it. Let's see whether I will spray my celica to matt pearl white with only at RM2100 while the price I got for a pearl white was RM2800 previously.